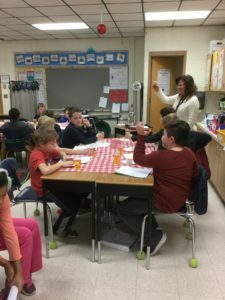 A student stands up, raises his plastic cup of apple juice and says, “I’d like to toast Mrs. G for helping us write our personal essays.” His classmates smiled and nodded, clinking their cups together and taking a sip. Moved to tears, I smiled at Mrs. G and thought, she deserves to hear this. We all do! Moments like these remind me how important it is to celebrate and celebrate often! Years ago when I was a classroom teacher, I frequently found myself in the following situation. It is the end of the marking period. Grades are due in 2 days. I “speed conference” making my way around the room, cheering on kids and in some cases, begging them to finish their published pieces of writing I’d hoped to wrap up a weeks ago. “We have to finish these feature articles so we can launch poetry on Monday,” I’d think to myself. I just don’t have time for a writing celebration. Maybe next unit. Back then I thought writing celebrations had to be grand events. Now some years later I realize that they are critical components of every writing workshop and that they can be simple moments of acknowledging hard work and growth. In the back of her book, The Writing Strategies Book, Jennifer Serravallo offers a number of simple, doable ways to celebrate writing one of which is a toast. Most require little cost and preparation. On this day in Mrs. G’s class, students toasted their essays and their growth as writers. They talked about the tough parts and in some cases, how surprised they were about what they accomplished. 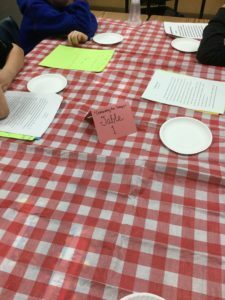 By encouraging students to toast not just their final essay but also their hard work, Mrs. G drew attention to the importance of valuing the process of writing. One student shared, “Writing an essay was really tough.” Another chimed in, “But we made it!” Students celebrated their growth as writers. One shared, “We used to think writing a paragraph was enough. Now we can write a whole essay!” Celebrating hard work in this way will help students persevere in future writing projects. Students cheered each other on. They validated one another each time they raised a glass and took a sip of their juice to acknowledge a toast. There was a spirit of “WE did it!” in the room. Mrs. G used the technique of a symphony share where students wait for a quiet moment before speaking rather than raising their hands. This mature format fostered a sense of respect for one another. As teachers, we deserve to be celebrated. When Mrs. G’s student raised a glass to her, I realized that I want every teacher to experience hearing words of gratitude from the students they serve. The reminder that we are making a difference inspires us to keep working with a shared purpose of developing student writers and voices. Additionally, experiences like this encourage students to develop the powerful lifelong practice of expressing gratitude. Witnessing students’ pride in themselves and their work reminds me why I chose this profession. It also made me wonder about other moments of our day that warrant celebration. Why not celebrate the end of a math unit? The completion of a book club cycle or just stop in the middle of a unit and marvel at student growth? Giving yourself and your students the gift of celebrations, I’ll drink to that! I love this reflection on the power of celebrations! You’re right, so often we rush through them (or skip them altogether) because of time, forgetting that they’re such an investment into our writers and our classroom culture. Thanks for inspiring me this evening!